A real estate and personal property auction will be hosted at Copenhaver Castle by Auction Systems Auctioneers & Appraisers, Inc. on Saturday, February 13, 2010. Copenhaver Castle was built on 5 acres of land over a 12-year period by Phoenix orthodontist Dr. Mort Copenhaver. The exterior walls of the home were built from stone blasted from the mountainside property, which makes the home blend into the mountains terrain. "Auction Systems is really excited about the auction at Copenhaver Castle; it is one of the most beautiful and historic homes in the Phoenix area," said Deb Weidenhamer, CEO of Auction Systems. "We are also very excited about the wide variety of other items up for bid including the wonderful furniture, artwork and sculptures that fill the mansion." This majestic home was featured on Bob Villa's 'This Old House' in 1986 and the highly requested episode is frequently re-shown on The Learning Channel due to the castles beauty and uniqueness. This 7000 square-foot mansion at-a-time was toured by tourists and Phoenicians alike but is now strictly a private residence. The contents of Copenhaver Castle as well as the real property will be sold to the highest bidder. All the contents of this 20-room mansion will be auctioned off as well as the beautiful home that sits in the shadows of Camelback Mountain. 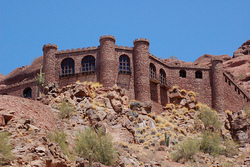 Copenhaver Castle is one of the most unique buildings in the Phoenix area. It is modeled after an old Moorish fortress in Spain and is a prime example of medieval architecture, featuring large cut stone crenellated walls, arched windows and round towers. The 7000 square foot mansion has eight levels and ten balconies that provide a great view of the valley. It has twenty spacious rooms, including five bedrooms, seven and one half bathrooms, and three garages and carports. The castle is filled unique features including a living room with a seventeen-foot waterfall, a billiard room and a dungeon that is accessed through one of the many secret passageways in the home. The outside also features a drawbridge and a moat as well as a beautiful stone driveway. Some of the items available at the Copenhaver Castle auction will be: sculpture, artwork, furnishings, jewelry, lighting, carpets, vehicles, motorcycles, electronics, and more. The auction will be held on Saturday February 13, 2010 at 10am (MST) There is a $20 entrance fee per person per day. No children under 12. All of the items listed in the auction may be previewed and inspected by interested bidders Wednesday through Friday 2/10-2/12 from 10am-4pm and Auction Day from 8-10am. Castle parking is only available at the Phoenician Resort at 6000 East Camelback Road Scottsdale, Arizona. Buses will be available at the Phoenician to transport bidders to Camelback Mountain where jeep service will transfer to the Castle. Participants should anticipate a minimum of 3 hours for the event. The Castle is not ADA compliant and appropriate footwear is recommended. All participants will be required to sign liability waiver. No pedestrian or auto traffic allowed at the auction site location. Due to location logistics all items sold will be transported to the Auction Systems warehouse for pickup on Thursday 2/18 between 9am-5pm. Delivery will be available for an additional fee. There are no exceptions. All purchases must be paid for on auction day. These items will also be available for online bidding on Saturday, February 6, 2010, ending at midnight prior to auction day. Interested parties can visit Auction Systems Copenhaver Castle Real Property and Personal Property auction and sign up for online bidding.